Honeywell Vista CADVDP07M video door phone is easy-to-use with user-friendly interface and minimal installation. The system is composed of an indoor monitor and a door camera. Slim and lightweight, the indoor monitor is composed of a 7″ LCD to project clear images for viewing. The door camera is equipped with LED lights and weatherproof chassis for outdoor night time or dim conditions. With built-in memory, 50 photos can be saved in the CASVDP07M, providing an accurate visitor record for house owners’ reference. A maximum of 32G SD card can also be used for storage expansion. 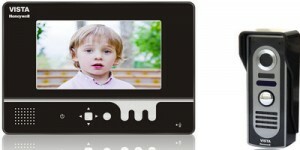 The Single Module version supports 1 monitor and 1 camera; or 2 monitors and 1 camera.